A good weather radio should be an essential for every American household, since they could become a life-saving device. Since the United States is prone to floods, tornados and other weather hazards, a weather radio might be the one thing that will protect your family! So, what are the best weather radios available today? Find out by reading our overview below. Weather radios could be considered as a fire alarm for the weather. When a dangerous weather situation is about to hit your area, the weather radio can notify its users. For example, if a tornado is about to hit your area, then the weather radio will sound the alarm after receiving an alert from the National Weather Service. Since there are many different types of weather radios available today, it is certainly useful to be informed about all the extra features these radios can provide. Below, you will find the best weather radio brands, but also our top picks for best weather radios in the United States. As you can imagine, there are many different brands of weather radios available. Below, you will find some of the best brands, which produce the most reliable weather radios with special features. Read on to discover more information about each brand, so you can determine the brand that fits your needs best. Midland weather radios are considered as some of the most reliable weather radios in the United States. The company has been creating their weather radios over more than 50 years; this makes them one of the pioneers where weather radios are concerned. Even though Midland has its headquarters in Kansas City, the company exports its weather radios across the world. Midland products are sold in consumer electronics stores, sporting goods stores, specialty outdoor stores, and many other retailers. So, if you are looking to obtain a weather radio from Midland, you will not have much problems finding a retailer near you. Eton is an American brand that focuses on designing and manufacturing weather radios. Their aim is to keep Americans prepared and informed, but also keep them mobile with their various mobile weather radio solutions. Weather radios are not the only products that are made by Eton, because they also produce backup battery packs, solar-powered sound systems, and other equipment that could be used during an emergency weather situation. Like the Midland brand, Eton has extensive experience, since this brand has been producing radios for more than 30 years. Therefore, Eton could be another reliable choice for consumers looking to buy a weather radio. Sangean is one of the leading manufacturers of consumer electronics in the United States; this includes electronics such as WIFI, internet, clock radios, weather radios, iPhone docket stations and much more. The Sangean company is another brand with extensive experience, since this company was founded in 1974. The brand has a reputation for manufacturing their products to meet the highest standards, so it is no surprise that their products are exported around the world. Kaito is one of the leading manufacturers of electronic gadgets in the United States. The brand uses its own designs and features, which leads to some interesting weather radios for the United States consumer. However, the brand creates other electronics too; this includes test instruments and personal assistant systems. Midland WR400 Uses S.A.M.E. Digital Technology Can be programmed for 25 different countries and provinces Customizable alerts Siren of 85 db. The Midland WR400 Deluxe NOAA Weather Radio uses special S.A.M.E. technology, which is used to access the country’s warning system. The technology provides uses with instant weather updates from the National Weather Services, but also allows consumers to charge their devices by connecting it to the radio. To ensure the power never goes out during an emergency, the Midland WR400 Deluxe NOAA Weather Radio comes with an emergency power backup. However, the backup does require four AA batteries, which are usually not included with the Midland WR400. With the Midland WR400 Deluxe NOAA Weather Radio can be programmed for twenty-five different counties and provinces, ensuring that the consumer get the most accurate information. To ensure your area is covered by this weather radio, it is recommended to check with the manufacturer before purchasing. 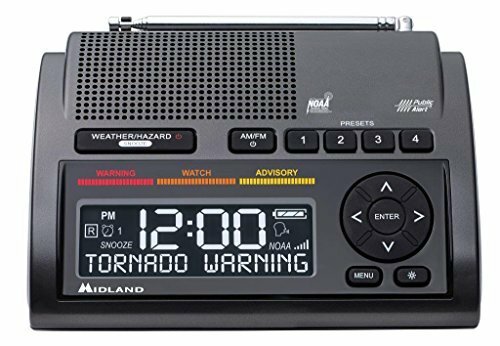 Consumers who choose the Midland WR400 NOAA Weather Radio also get to customize the alerts coming from this radio. The alerts will not be missed either, since this radio has a siren of 85 dB. The Midland WR400 Deluxe NOAA Weather Radio scores well across the board, but there have been some reported problems surrounding the AC plug. Despite the entire unit being quite durable, durability seems to be somewhat lacking for the AC plug. Therefore, it could be useful to have a replacement on hand just in case. When it comes to reliability, the Eton FRX5BT is probably the best choice. This weather radio is endorsed by the American Red Cross, and received a lot of positive reviews on various consumer websites. The weather radio is loaded with features too, which certainly proves useful in emergency situations. The Eton FRX5BT can be powered by the accompanying hand crank, which is also one of the best hand crank mechanisms out there. The weather radio can be powered through other means too; this includes the AC plug, USB, batteries, and even the sun. So, if one charging method fails, there are four others to choose from! When you choose the Eton FRX5BT, you can also count on seven NOAA weather stations, which provide the preferred S.A.M.E. alerts. The user can receive notifications specific to their area, something that can be configured in the settings. Consumers that choose the Eton FRX5BT also get a weather radio with unmatched reception and a high-quality speaker. Given the excellent reception of this weather radio, it is only natural it is a suitable option for areas subject to the most extreme weather conditions. With the Sangean CL-100 weather radio, consumers can program radio alerts for their location; this ensures that the consumer only gets alerts relevant to them. After configuring the Sangean CL-100, the weather radio will access relevant NOAA radio frequencies. Compared to some other weather radios, the Sangean CL-100 is one of the more compact weather radios out there. However, despite its compact nature, the weather radio remains remarkably durable. One of the features we love most about the Sangean CL-100 weather radio is the scrolling display. When an emergency weather situation occurs, the text from S.A.M.E. will be rolled over the screen. The display can also be used for some of the other features; this includes the sleep times, wakeup alarm, and the clock. The Kaito KA700 is an acquired taste, because this weather radio has some quirks. Still, despite the quirks this weather radio clearly has, it is still one of the better weather radios available today. One of the biggest problems with the Kaito KA700 is the battery life. When fully charged, the Kaito KA700 only lasts an hour and twenty-seven minutes. Still, if you can live with a shorter power span, you will love some of the extra features this weather radio has. With the Kaito KA700, consumers can receive AM, FM, and the NOAA shortwave radio frequencies; this enables the consumer to stay informed about emergency weather situations. The weather radio also includes a light, which proves useful during power outages. The Kaito KA700 could be a good option for campers too, because this weather radio contains additional features such as a thermometer and humidity meter. Despite the failing power levels of the Kaito KA700, additional power can be obtained by using the hand crank. When turning the dynamo for two minutes, users can get an extra four minutes of battery life. Even though the average for a 2-minute dynamo turn is five minutes, the Kaito KA700 does charge faster than some of the other weather radios out there. In addition to the hand crank, consumers can also charge this weather radio by using the AC adapter, emergency battery pack, USB port, and the accompanying solar panel. So, even though the charge does not last as long, there are many ways to keep this weather radio going. Most Kaito KA700 weather radios come with a one-year manufacturer guarantee; this is usually the length of guarantee you will receive for a weather radio. Kaito scores better than average where customer support is concerned though, since reviews from customers seem to be quite positive when contacting the Kaito customer support team. When it comes down to choosing a weather radio, there are so many things to consider. Firstly, you want to make sure it has all the essential safety features, but many people also want some of the advanced extras currently available for these kinds of radios. However, these are the main features you should check before you obtain a weather radio for emergency weather situations. A weather radio should be heard in case of an emergency, so the maximum volume of your radio and the alerts it provides should be good. Good weather radios should have a maximum volume of at least 80 dB. Another important feature of a decent emergency radio is the battery life, because you do not want the power the fail when you need your weather radio most. Of course, with battery power also comes the various methods you could use to power the weather radio. Therefore, it is recommended that a good weather radio has at least three ways to power it. Sometimes it is easy to forget to charge your weather radio, especially if you only use it when emergency weather occurs. Therefore, charge time could be more important than you think. The lower the charge time, the better. Charge times that are considered good for weather radios usually lay between 1.5 hours and 3 hours. When you have no access to batteries or a power outlet, cranking the weather radio is often the only way to make it work. Therefore, it is essential to look at how much battery life you would get after cranking a weather radio. Battery life after cranking can be quite variable, so the standard for battery life is difficult to determine. However, one of the best radios where battery life after cranking is concerned is the Eton FRX5BT, which has a battery life of 13 minutes after two minutes of cranking. Still, the average post-cranking battery life has been determined at 5.5 minutes. So, if you find a weather radio with 6 minutes of battery life after cranking, it will also be deemed as good. Still, even with a good battery life, make sure to check for additional charging methods.